This large note US $2 bill flew on the last flight of the Mercury space program in the space suit pocket of astronaut Gordon Cooper. This bill, along with all of the Jefferson Space Museum bills, has been officially slabbed and certified by PMG. Note the hand written flight certification and autograph on the bill by astronaut Cooper. On the back of each bill's label in the PMG slab, the bill's flight status is referenced. 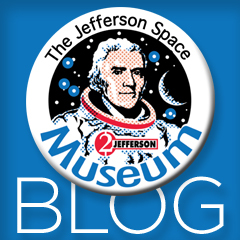 The Jefferson Space Museum is pleased to announce that all of the space flown bills in the collection have been officially certified and slabbed by Paper Money Guaranty, one of the leading paper money authentication and grading services. We took the bills to the PMG offices in Sarasota back in November. We presented PMG with the originals (and copies for their files, as we retain the originals) of all of the background paper work on each bill -- their history, their flight provenance, and all relevant documentation. Copies of this official documentation will always reside with PMG. We took this step of further authenticating these bills for their appeal to the numismatic community, after PMG's sister company NGC certified Buzz Aldrin's lunar surface flown Peach Dollar from Apollo 11. NGC also slabs, grades and certifies space flown Robbins and Flightline medallions, making it a natural for us to select PMG for the space flown $2 bills from our collection.